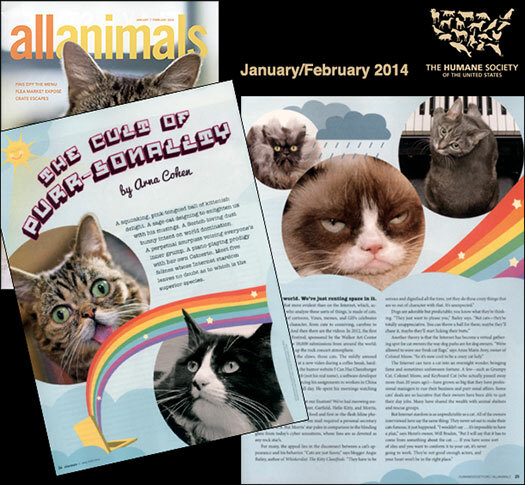 If you, my friend, are a member of the Humane Society (and you certainly should be), please be sure to check Anna Cohen’s wonderful article in the Jan/Feb 2014 issue of the member’s magazine, All Animals. It’s titled “The Cult of Purr-sonaity” and features a five of the most charismatic felines on the Internet today. And, of course, I’m one of them. That kind of goes without saying. I’m just sayin’. P.S. Don’t forget to check out my latest videos by clicking the Videos tab at the top of the page. I’m glad you are still getting the kudos you deserve, Nora!